The Forth Road Bridge when opened, on 4th September 1964 by Her Majesty Queen Elizabeth II, was the largest suspension bridge in Europe. It was built in 1958 and finished in 1964. This highway suspension bridge crosses the Firth of Forth in Scotland and just half a mile away from the Forth Railway Bridge ( The Railway Bridge is the second longest cantilever span in the world. Even today, no other bridge can match it for awesome scale and it was built in 1890.) 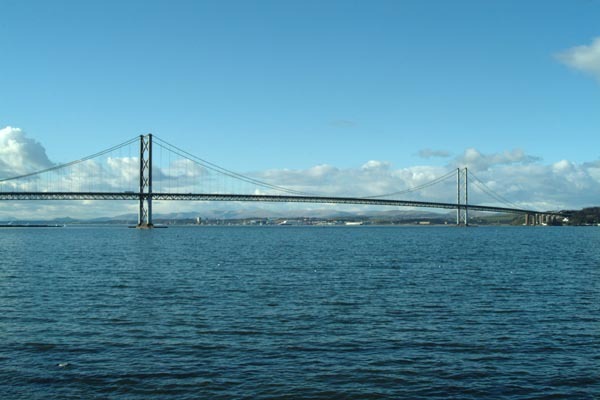 The Forth road bridge is a little over 2.5 km in length. It has a main span of 1006 metres between the two main towers. The side spans which carry the deck to the side towers are each 408 metres long. The approach viaducts are 252 metres and 438 metres long on the north and south sides respectively.